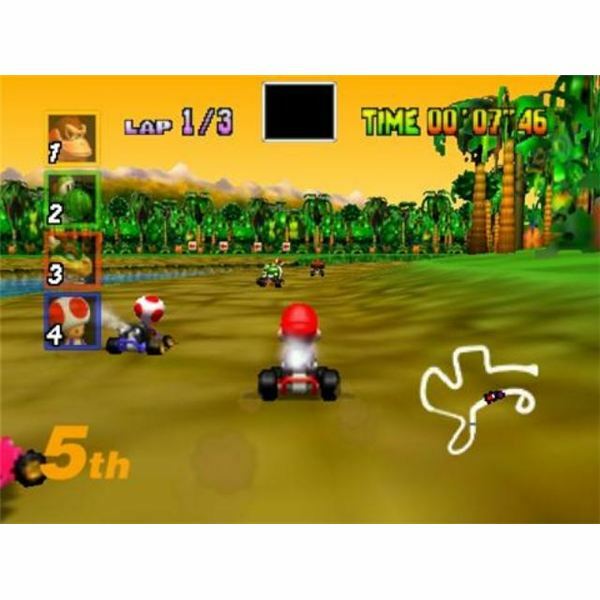 When word got out that a new Mario Kart game was coming out for the Nintendo 64, fans of the first entry in the series, the Super Nintendo’s Super Mario Kart, rejoiced. The game would sport real 3D graphics, tons of Mario charm, and addictive gameplay. To this day, gamers continue to play Mario Kart 64, and it’s no surprise, because this little kart racer is fast and fun. It may not be as deep as its predecessor, but Mario Kart 64 on the Virtual Console still provides some great racing gameplay. Unlike the first entry in the series, Mario Kart 64 is a lot more accessible, and its learning curve is far lower. There are three different weight classes: lightweight, middleweight, and heavyweight. Despite the fact that each character feels slightly different, it’s not difficult to master using all of the characters, because the basic controls, mechanics, and physics are not all that different. Lightweights turn poorly, heavyweights take a while to reach their top speeds, and middleweights are fairly well-rounded; but the differences are subtle at best, which is great for beginners, but leaves a bit to be desired for the more advanced Mario Kart player. 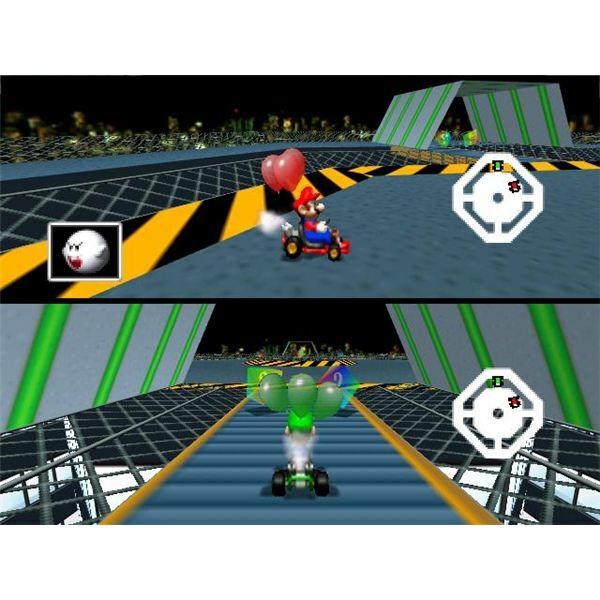 The formula in Mario Kart 64 is the same that we’ve all come to know and love about the series. 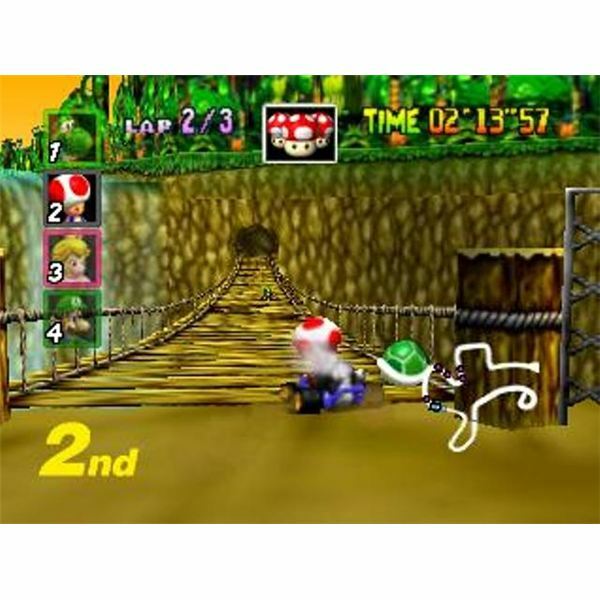 You must complete three laps around each course, using Red Shells, banana peels, and the ever unfair Spiny Shell. To that point, this second entry in the series introduced the element of “pity” for racers who were trailing behind. In other words, if you’re far behind the other characters, expect to receive speed-enhancing power-ups and multiple projectiles. Still, despite its over-accessibility, Mario Kart 64 is tons of fun. Each of the game’s 16 tracks is cleverly designed, and you’ll instinctively want to master all of the turns and shortcuts to be found in the game. All the basic modes are here: Time Trial, Grand Prix, Versus, and Battle, the last three of which can be played with friends. It’s not an overabundant number of modes—it never was—but it’s enough to keep you entertained for a good while. And gamers who get together with a friend (or three) will have the added bonus of playing the game’s multiplayer modes, which are the real meat and potatoes in any Mario Kart game. 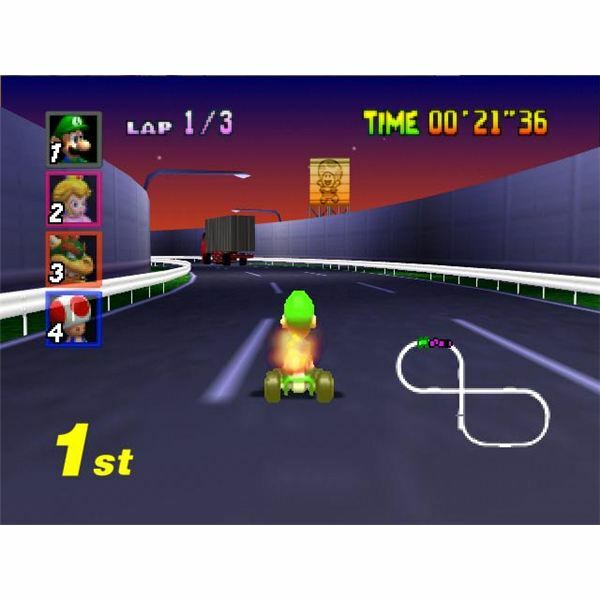 At the time of its release, Mario Kart 64 was lauded for featuring impressive 3D graphics. Unfortunately, the game’s visuals really show their age on the Virtual Console, and this title does not hold up especially well these days. Everything looks muddy, there’s no real detail in any of the backgrounds, and character sprites are a pixilated 2D mess. In terms of sound, the only noteworthy attribute is the use of character speech. Hearing Wario’s sinister laugh or Donkey Kong’s grunts provides a certain amount of comic relief, which is great because the game’s soundtrack, though catchy, isn’t all that great. Mario Kart 64 was never an incredibly deep game. However, it was and still is an incredibly addictive game. While playing through Grand Prix mode doesn’t provide a great deal of length, you’re more than likely to lose track of time as you play against your friends. The game’s Versus and Battle modes are engaging, and even though there are only four Battle maps, it’s fun going back and trying to take out your buddies multiple times. One of the downsides you encounter when you download Mario Kart 64 on the Virtual Console is the lack of an option to save your ghost data in Time Trial mode. 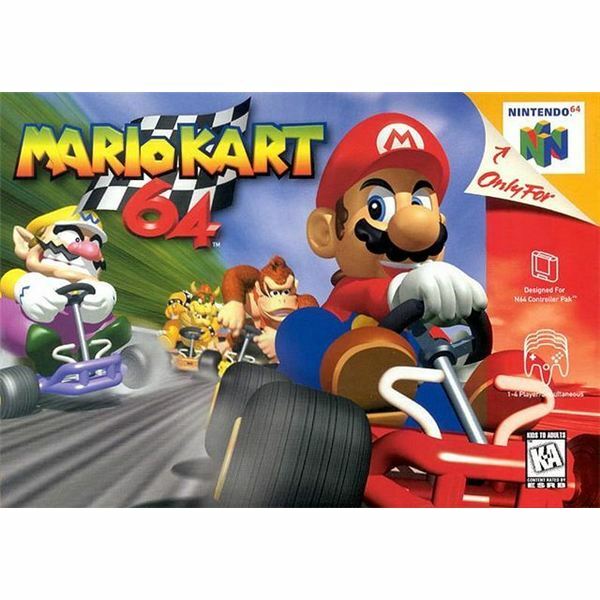 In the original cart, you could save your best time onto a Nintendo 64 memory card and race against the see-through ghost whenever you desired. Such a feature is absent here. And while it’s a bit of a letdown, it’s a gripe that can be overlooked, especially when you consider the multiplayer focus of Mario Kart 64. Time hasn’t been very kind to Mario Kart 64 in terms of technical appeal. The graphics are ugly, the sound is plain, and Time Trial mode is missing the feature that made it so awesome. Having said that, time has not diminished the amount of fun you can have if you get together with a group of friends and get some races going. Gamers continue playing this game for a reason: because it’s a heck of a lot of fun. If you’re in the mood for some accessible kart racing, don’t hesitate to download Mario Kart 64.